Introduction: Gastroduodenal intussusception is a rare condition. Fewer than 80 cases have been reported in the literature. Usually, a gastric mass acts as a lead point of the intussuception. Both benign and malignant tumors have been implicated as potential lead points. Case Presentation: A 79 year-old female presented to the ER with dysphagia and epigastric pain for 1 day. She had symptoms of gastric outlet obstruction and underwent EGD. This demonstrated gastritis and she was treated for H. pylori. However, she returned to the ER several times in the next 3 weeks with recurrent symptoms. Repeat EGD demonstrated intussusception of the gastric fundus into the duodenum, which was reduced. She recurred again and was more difficult to reduce on endoscopy. Thickened gastric folds were noted in the fundus. EUS and CT demonstrated no mass. She was referred for laparoscopic gastropexy. The greater curvature of the stomach was mobilized and the short gastrics were taken down to examine the posterior wall of the fundus. No mass was seen or palpated. The patient was discharged on the second postoperative day. There has been no recurrence of symptoms at six week follow-up. Methods: English language literature was reviewed. 42 articles were identified from 1966 through 2009. There were no randomized trials. 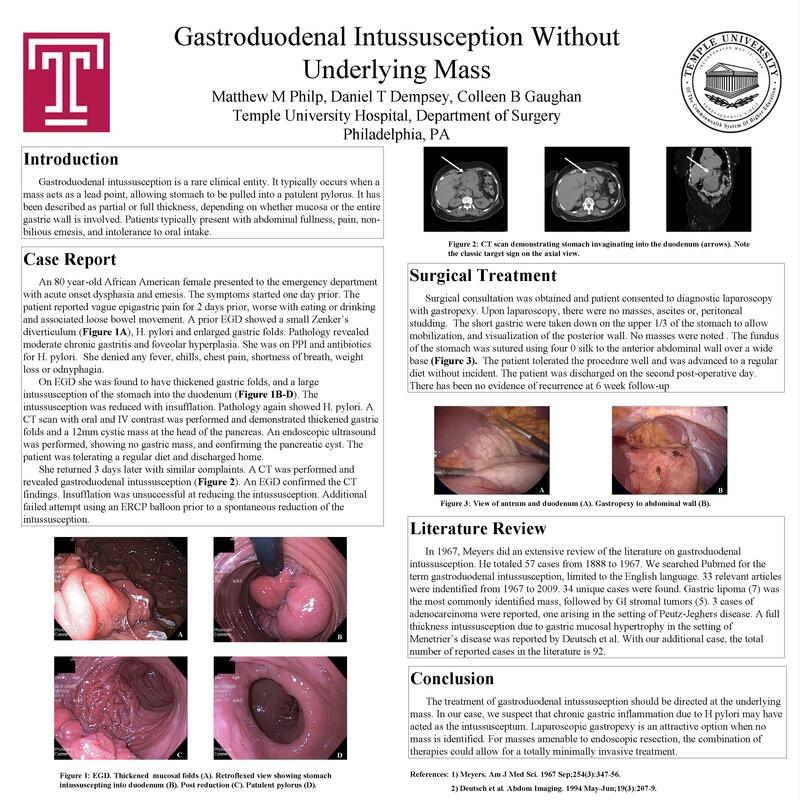 Discussion: The majority of patients with gastroduodenal intussusception have an underlying gastric mass that acts as a lead point. Adenomatous polyps and leiomyomas are most commonly identified. Carcinomas and sarcomas are rarely found. The typical treatment is surgical, to remove the underlying mass. In patients without a mass as a lead point, laparoscopic gastropexy can be performed to prevent recurrence. Conclusion: In a patient without an identifiable mass, laparoscopic gastropexy presents an attractive alternative to formal gastric resection.